Israeli Occupation Forces (IOF) early Sunday made a limited incursion into Palestinian lands east of Rafah south of the Gaza Strip. 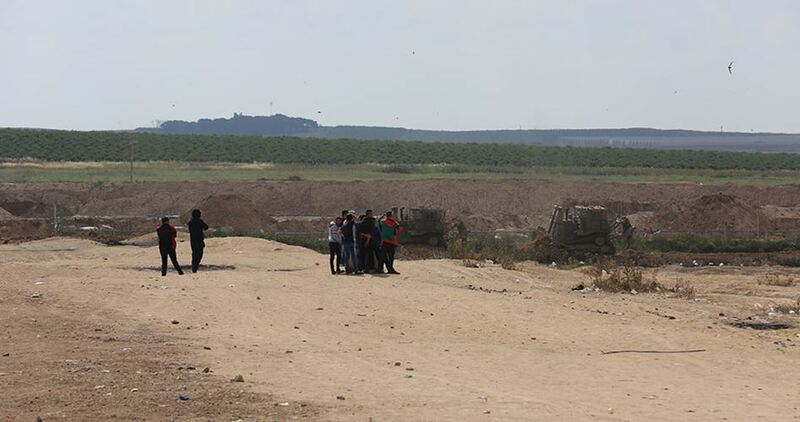 Palestinian sources said that four Israeli bulldozers coming from the Sufa military site entered 50 meters into eastern Rafah City, escorted by four military jeeps as drones flew overhead. Israeli military incursions inside the besieged Gaza Strip and near the “buffer zone” which lies on both land and sea sides of Gaza, have long been a near-daily occurrence. The Israeli police on Saturday detained and interrogated several members of delegations who participated in a conference on Occupied Jerusalem held by the Palestinian Authority in Ramallah a few days ago. 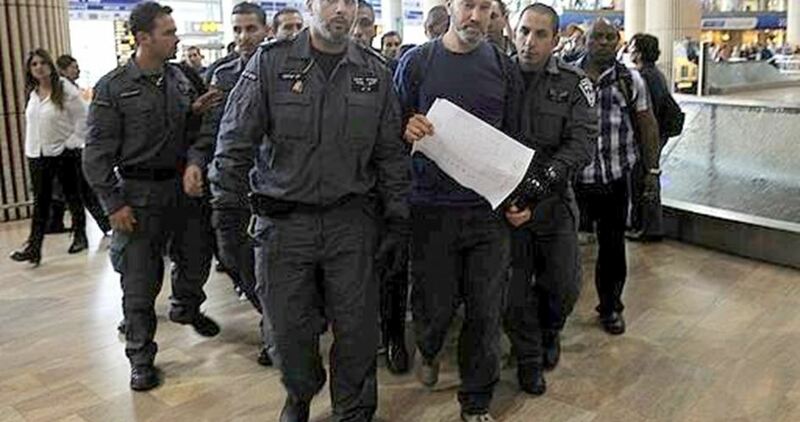 A spokesman for the 9th International Conference on the Holy City of Jerusalem told Quds Press that Israeli police officers detained and questioned several guests who attended the conference for long hours as they were waiting for their flights at al-Lod (Ben Gurion) Airport near Tel Aviv. The spokesman added that police officers deliberately humiliated and maltreated them at the airport. He affirmed that the guests were interrogated about their participation in the conference, which was held by the PA ministry of religious affairs, about the people who organized and spoke at the event. According to al-Jazeera website, a number of international religious figures and politicians, including a Ghanaian legislator, had been denied entry by Israel after they were set to attend the conference on Jerusalem. The 9th International Conference on the Holy City of Jerusalem kicked off last Wednesday, but there was a glaring absence of attendees, including a 13-member Indian delegation, a mufti from Sri Lanka, a Bosnian Muslim scholar, and the head of Australia’s Islamic Council. 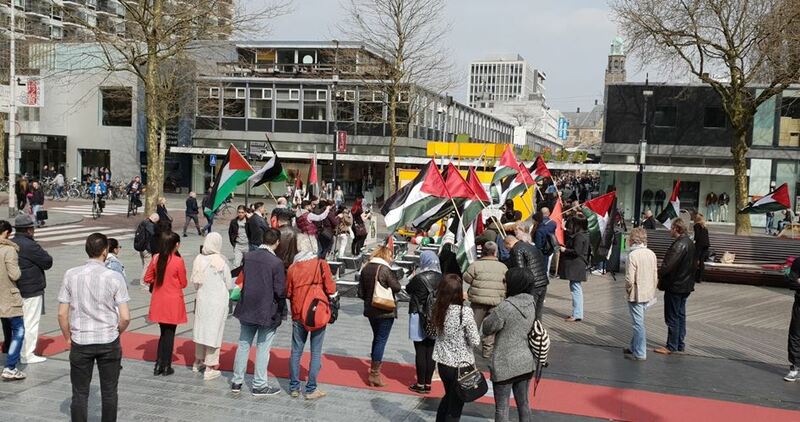 The Palestinian community in Netherlands in cooperation with Movement x Organization on Saturday organized a solidarity protest in Rotterdam city in support of the Great March of Return in Gaza. The participants condemned the ongoing Israeli aggression on the Palestinian people and called for an end to the crimes committed against peaceful protesters in Gaza. Palestinian flags and banners having the names of the protesters killed since the launch of the Great March of Return were raised during the protest. The Palestinian community in Netherlands are planning a series of popular events in Rotterdam in the coming days to express support for the right of return and mark the 70th anniversary of the 1948 Nakba. 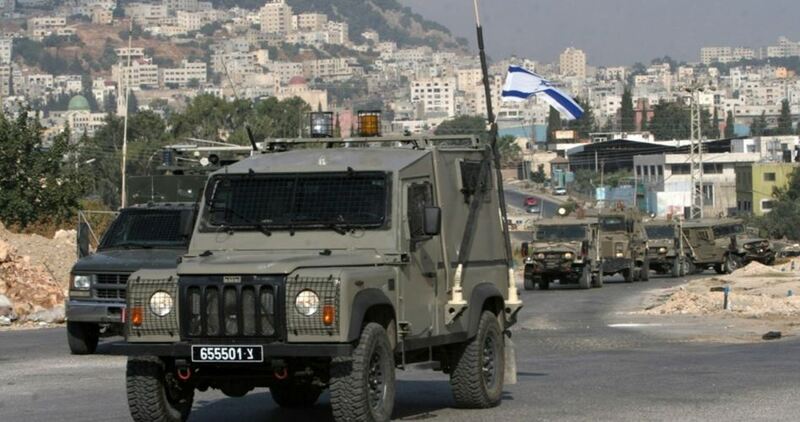 The Israeli occupation forces on Saturday evening closed off Beit El checkpoint set up at the northern entrance to Ramallah province, in the central occupied West Bank, blocking Palestinians’ access out of and into the area. According to local sources, the measure has resulted in traffic congestion as dozens of vehicles and civilians lined up in the streets on their way to their workplaces and homes. The move comes as part of Israeli attempts to dismember Palestinian communities throughout the occupied West Bank. At the same time, four Palestinians were kidnapped by Israeli soldiers near an illegal settlement built on Palestinian land west of Ramallah. On 6 April 2018, the second large Friday demonstration of the Great March of Return in Gaza, Israeli occupation forces shot and killed nine Palestinians at the mass popular demonstration. Among those targeted by Israeli occupation snipers was well-known Palestinian photojournalist and videographer Yaser Murtaja, whose work was known internationally and who had been retained by the Norwegian Refugee Council to cover the events of the March. 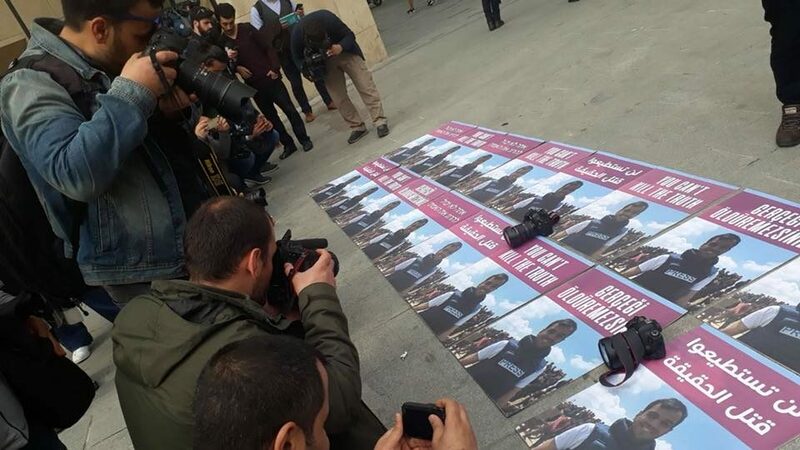 Murtaja, 30, was wearing a protective vest prominently labeled with the word “PRESS.” International protests have responded to the killing of Murtaja, including vigils organized by close friends and fellow journalists in global cities. Murtaja was a prominent member of the community of journalists in the Gaza Strip and a founder of Ain Media, which was known for photographing Gaza footage using aerial drones. After shooting down Murtaja as he filmed the demonstration, infamous far-right, racist Israeli Defense Minister Avigdor Lieberman attempted to justify his killing by labeling him as affiliated with Hamas. Lieberman also claimed that there were “no innocent people in Gaza.” While Lieberman’s words indicate the murderous intention of the Israeli occupation state toward Palestinians who have the right to resist and to choose their political affiliation, the comments in the case of Murtaja are particularly absurd, noted the International Federation of Journalists. Murtaja had, in fact, been detained by security forces of the Palestinian Authority in Gaza under the authority of Hamas in 2015, while documenting the demolition of a Palestinian home. He was beaten by security forces and required hospitalization. Murtaja was the married father of a 15-month-old son. He was one of six Palestinian journalists shot or injured during the march. 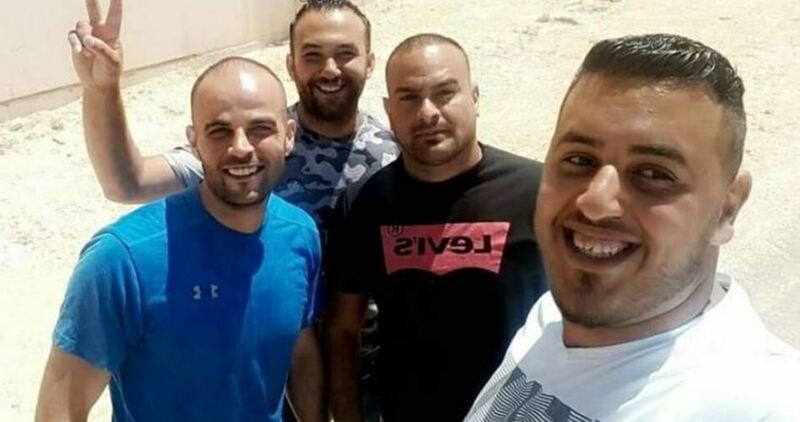 The others were Adham al-Hajjar, a cameraman for Medi1TV of Morocco; Khalil Abu Adhreh, cameramen for Al-Aqsa TV; Ibrahim al-Zaanoun, a freelance photographer; Ezz Abu Shanab, editor for Sky Press Agency; and Saber Nureldine, photographer for the European Press Photo Agency. When Murtaja was buried in a mass funeral in Gaza on Saturday, 10 April, his body was wrapped in a Palestinian flag as well as a “PRESS” vest. 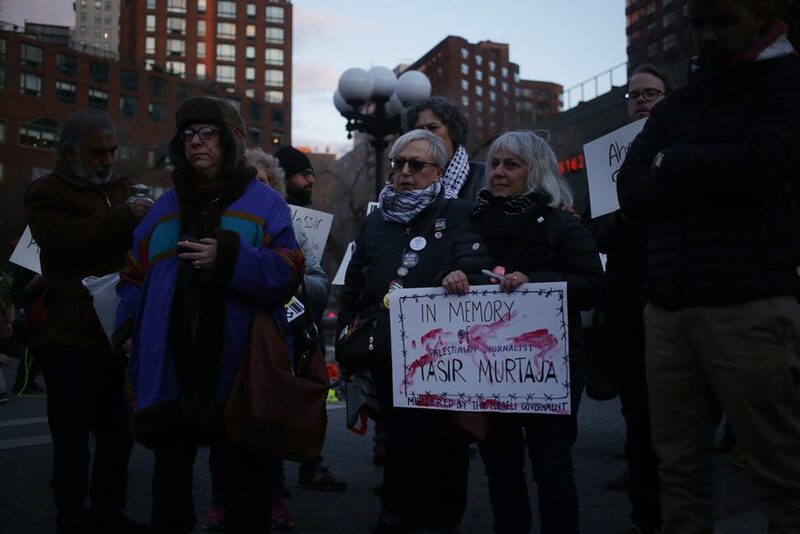 Murtaja has been honored with protests, vigils and memorials in Gaza and in several global cities, including London, Portland, Istanbul and New York. 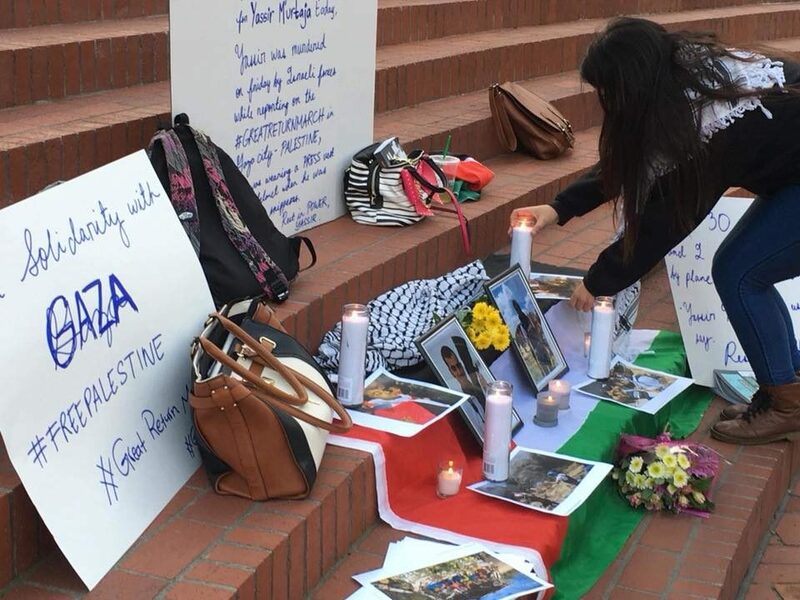 In Portland, Oregon, people gathered with candles and flowers, laying them before a Palestinian flag with photos of Murtaja on 10 April. 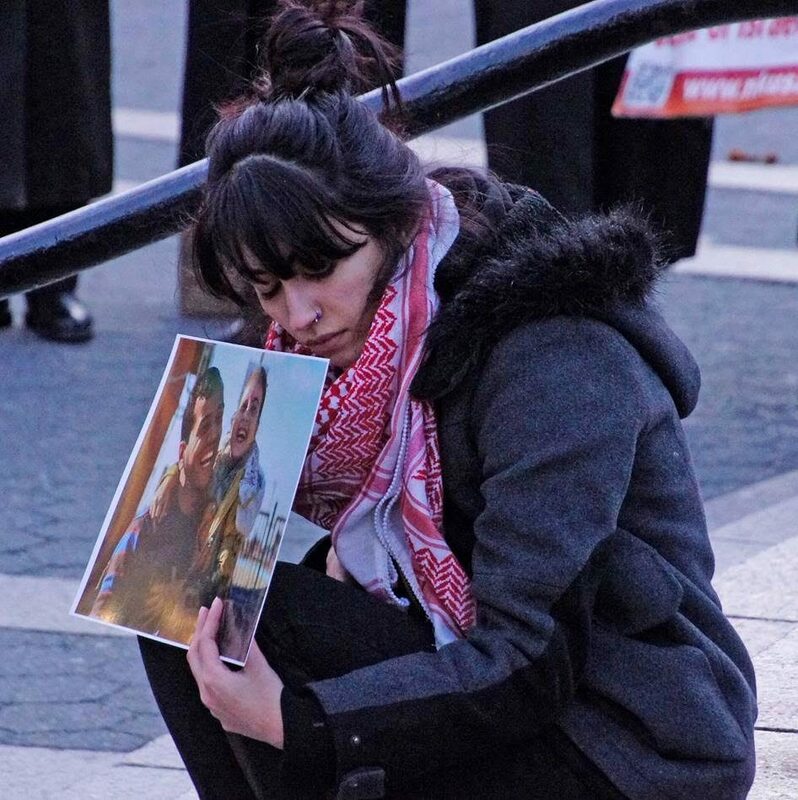 Nour al-Ghussein, a young Palestinian woman from Gaza, delivered a powerful, evocative memorial at the vigil. She was currently working on a documentary film, called “Between Two Borders,” with Murtaja. 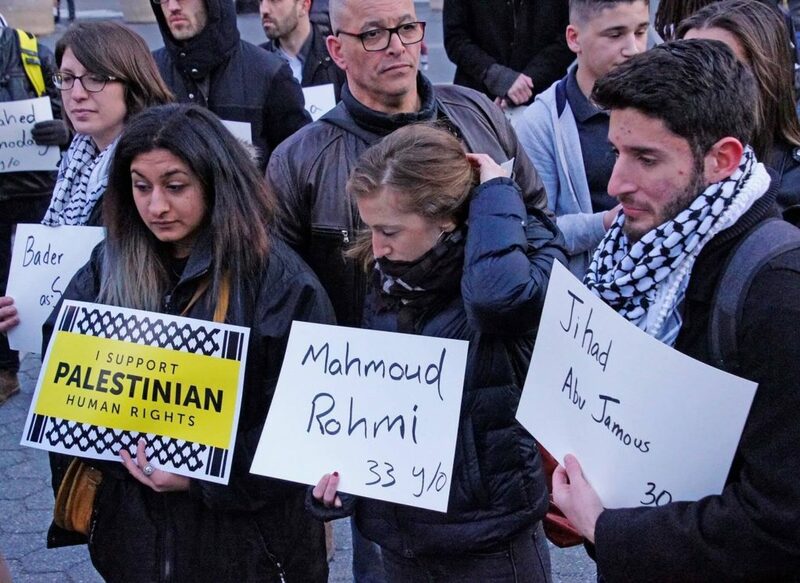 In New York City, crowds, including local organizers with Samidoun Palestinian Prisoner Solidarity Network and many other Palestinian and solidarity organizations, gathered in Union Square on 8 April for a vigil remembering Murtaja. The demonstration was organized by Palestinian youth who had worked with and befriended Murtaja, including Walaa al-Ghussein, Nour’s sister. 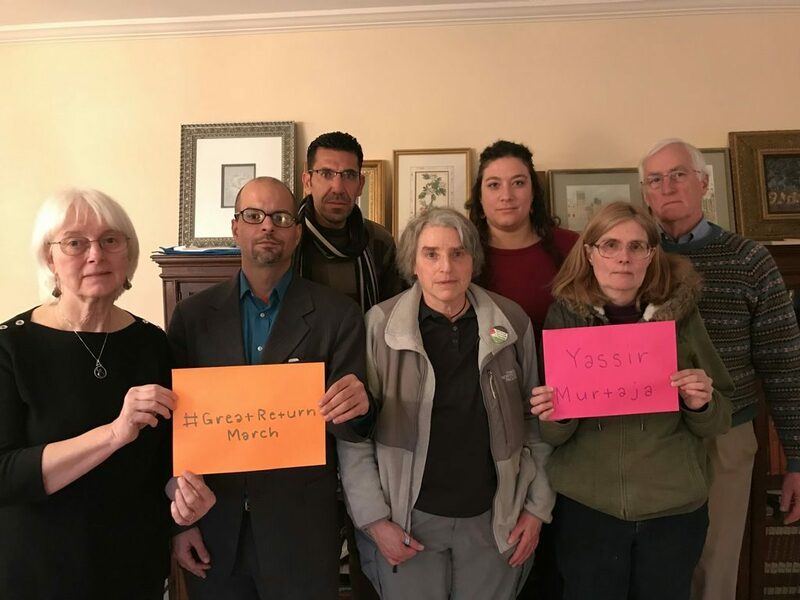 In Madison, Craig and Cindy Corrie, the parents of Rachel Corrie, joined Joe Catron and Islam Maraqa and members of the Madison-Rafah Sister City Project to express their remembrance of Murtaja. 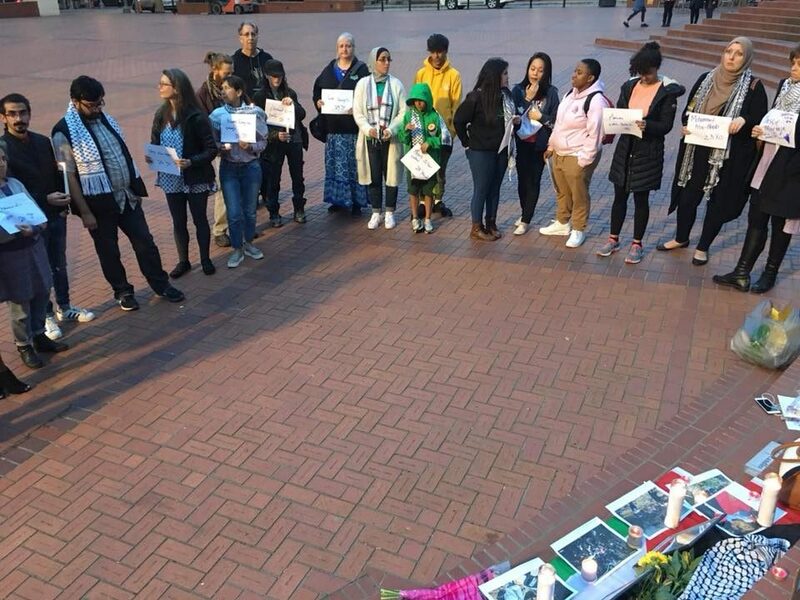 This solidarity photograph was taken at one of the ongoing events on the International Solidarity Movement spring tour, in which Catron, also the U.S. coordinator of Samidoun, and Maraqa are touring North America to inform audiences about the work of the ISM. 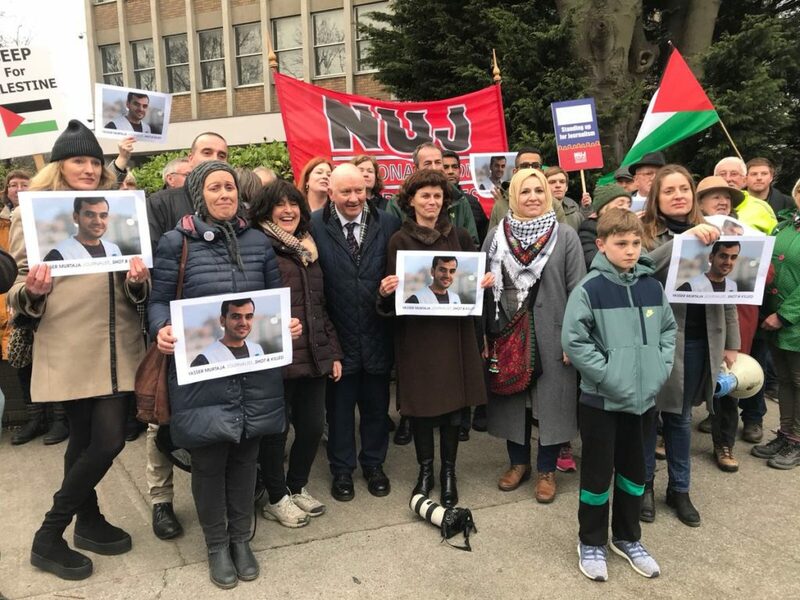 In London, the National Union of Journalists held a vigil in remembrance of Murtaja on 12 April, calling for justice and accountability for his killing. Participants carried Palestinian flags and photos of Murtaja. 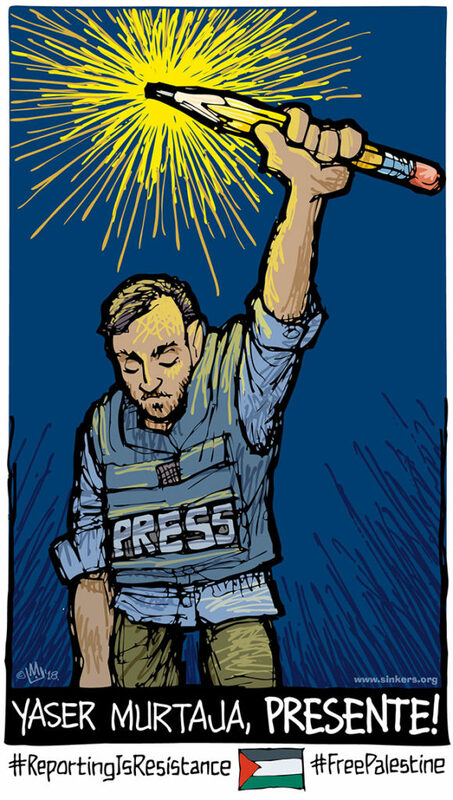 The IFJ has responded to past Israeli attacks on Palestinian journalists, including their imprisonment. For example, Palestinian journalist Omar Nazzal was on his way to a conference of the European Federation of Journalists – an IFJ affiliate – when he was seized by occupation forces at the Karameh crossing to Jordan and thrown in administrative detention without charge or trial. Ain Media itself issued a statement, noting that the Israeli occupation bears full responsibility for the targeting of Yaser, wearing a helmet and press shield and clearly actively filming. “We affirm that we will knock on all doors and work in every legal institution to hold the Israeli occupation accountable for this heinous crime,” it said. 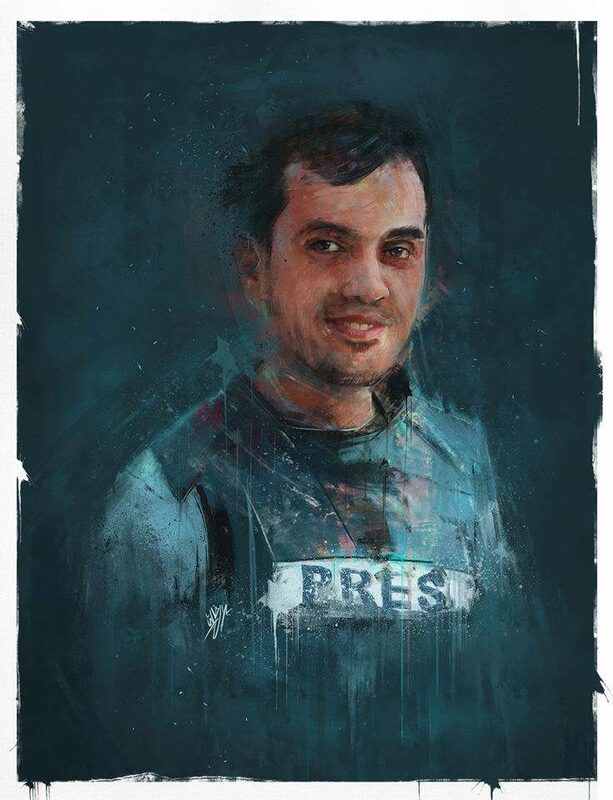 Samidoun Palestinian Prisoner Solidarity Network denounces the killing of Palestinian journalist Yaser Murtaja and notes that this killing takes place as part of a systematic attack on Palestinian journalists that includes targeting them for death, injury and imprisonment. Israeli occupation forces have repeatedly targeted journalists, and Palestinian journalists are routinely subjected to imprisonment, frequently administrative detention without charge or trial. 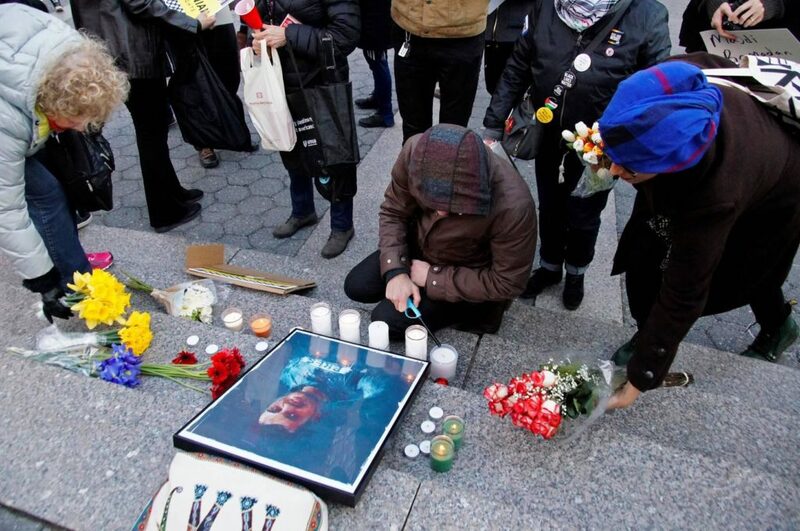 The cases of Mohamed al-Qeeq, Omar Nazzal and Bushra al-Tawil are three among dozens that underline this policy, alongside historic assassinations of Palestinian writers like that of groundbreaking novelist, writer and revolutionary Ghassan Kanafani in 1972. The work, the images and the words of Palestinian journalists are critical in sharing the Palestinian experience, narrative and struggle with the Palestinian people, the Arab world and international audiences. Palestinian journalists must receive international solidarity and Israeli occupation forces must be held accountable, including through global sanctions and an arms embargo, for their targeting of Palestinians who document the stories of their people. 1. Omar Wahid Samour, 31 — the farmer who was killed around dawn. 2. Mohammed Kamal al-Najjar, 25. 3. Jihad Zuhair Abu Jamous, 30. 4. Amin Mansour Abu Muammar, 22. 6. Nagy Abdullah Abu Hjeir, 25. 7. Musab Zuhair Al-Soloul, 23. 8. Abd al-Qader Mardi al-Hawajri, 42. 9. Mahmoud Saadi Rahmi, 23. 10. Mohammed Naeem Abu Amro, 26. 11. 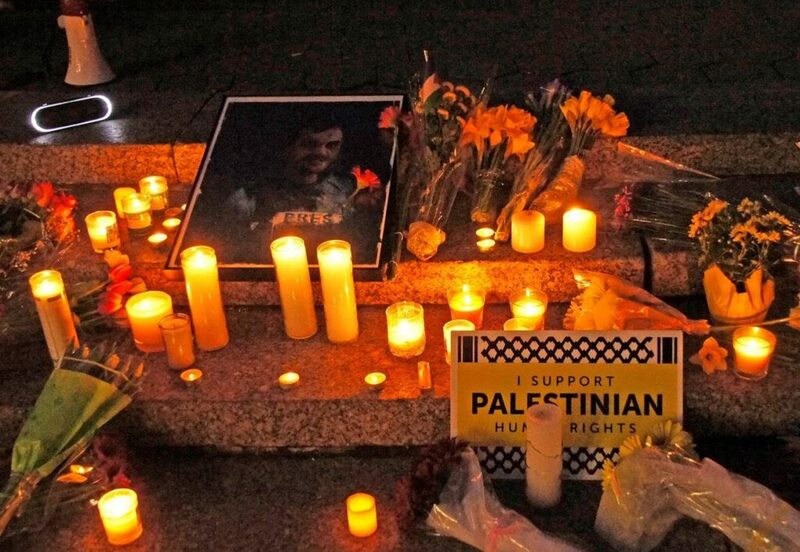 Ahmed Ibrahim Ashour Odeh, 19. 12. Jihad Ahmed Farina, 34. 13. Abdel-Fattah Abdel-Nabi, 18. Shot by a sniper from his back before camera. 14. 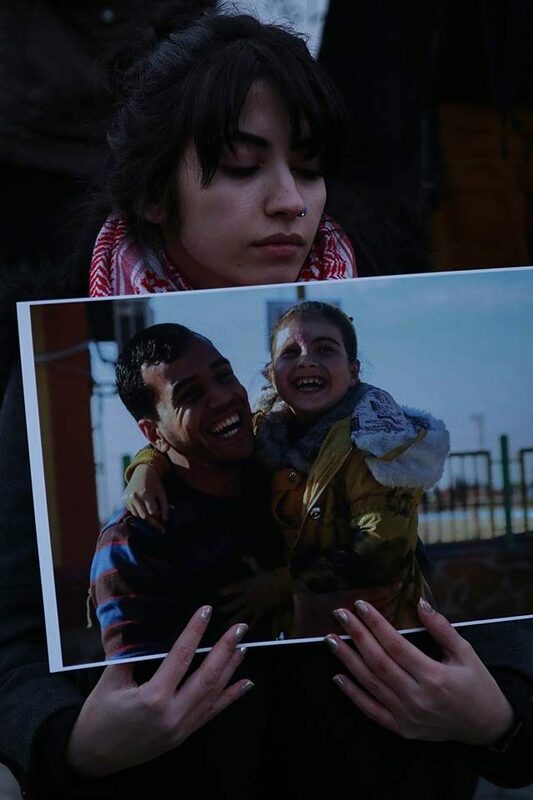 Bader Fayiq al-Sabbagh, 22. 15. 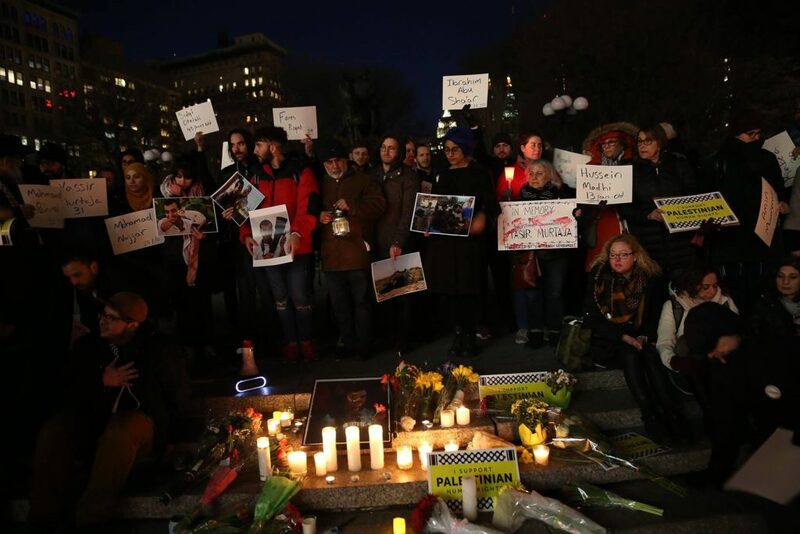 Sari Walid Abu Odeh, 27. 16. Hamdan Isma’il Abu Amsha, 23. 18. Ahmad Omar Arafah, 25. 19. Osama Khamis Qdeih, 38. 21. Hussein Muhammad Adnan Madi, 13. 22. 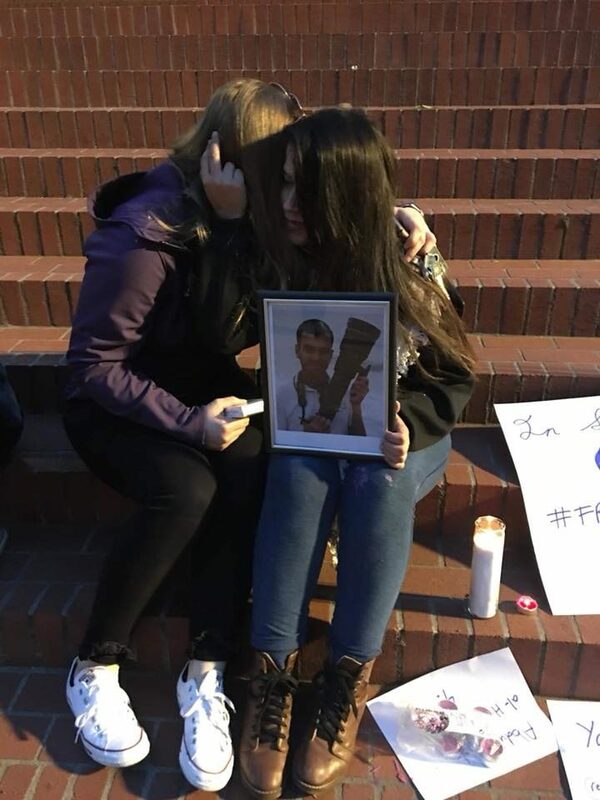 Subhi Abu Atawi, 20. 23. Mohammad Said al-Haj-Saleh, 33. 24. Sedqi Faraj Abu Atawi, 45. 25. Alaa al-Din Yahya Ismail al-Zamli, 15. 26. Hamza Abd al-Al, 20. 29. Mujahed Nabil Al-Khudari, 25. 30. 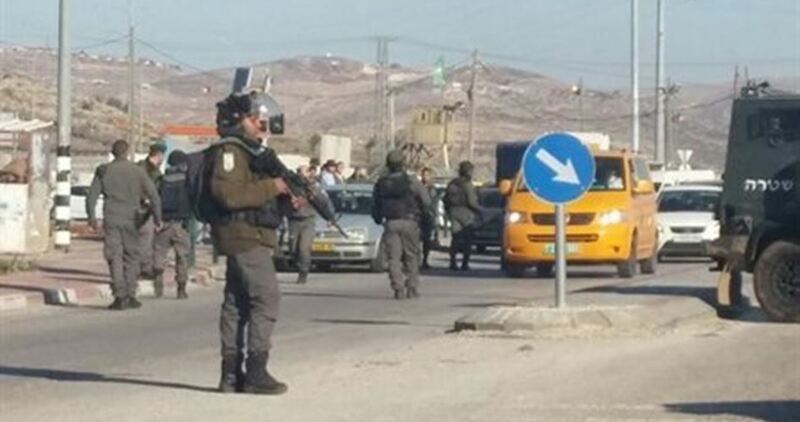 Marwan Odeh Qdeih, 45, succumbed to wounds. 31. Mohammed Hjeila, 30, killed in an airstrike in eastern Gaza on April 12. 32. Abdallah Al-Shahri, 28, killed in an airstrike on April 12. 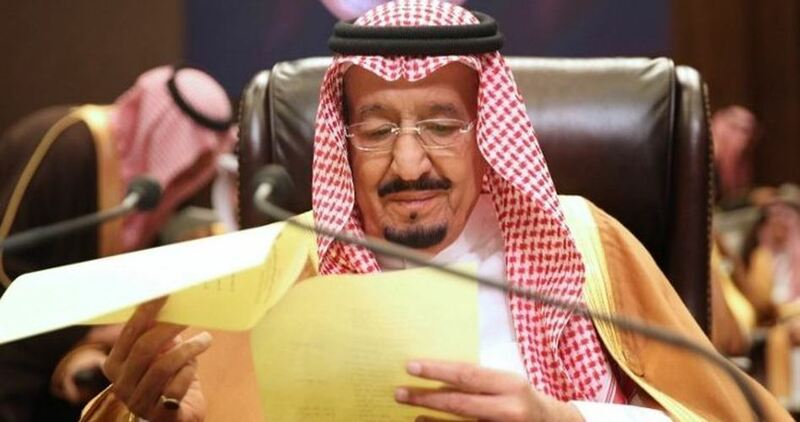 Saudi King Salman bin Abdul Aziz has said the Palestinian cause is a top priority for his country, stressing the Palestinian people’s right to establish their independent state with east Jerusalem as its capital. The Saudi monarch made his remarks during the opening session of the 29th Arab Summit, which kicked off on Sunday in the eastern city of Dhahran with the participation of Arab leaders and foreign dignitaries. The Saudi leader reiterated his rejection of the US administration’s recent decisions on Occupied Jerusalem and confirmed that east Jerusalem is an integral part of the Palestinian territories. He also hailed the international consensus that opposed the US decisions on Jerusalem. King Abdullah II of Jordan opened the Arab Summit in Dhahran, stressing the need for a two-state solution and condemning the US’s decision to move its embassy to Jerusalem. The Jordanian king affirmed that Jerusalem is the key to peace in the region and the cornerstone for achieving a comprehensive solution that guarantees the establishment of an independent Palestinian state within the 1967 borders and with east Jerusalem as its capital. The Israeli occupation police on Sunday released Palestinian prisoner Mohamed Derbas, from Jerusalem, after he completed his prison term and later issued a summons for interrogation against him. A local official in Jerusalem said that the administration of Ramon jail released Derbas, a resident of Issawiya district in east Jerusalem, after he served his 16-month prison sentence. Later, Israeli police and intelligence officers stormed the house of Derbas’ family in Issawiya and prohibited them from holding any festivity or meeting to celebrate the release of their son, according to Saleh Derbas, the prisoner’s brother. An Israeli officer asked the family to pledge in writing not to receive guests or put up flags or banners to celebrate Derbas’ release, but the family rejected to write or sign anything. The officer also handed the family a summons ordering Derbas to go to al-Maskubiya police station on Monday in west Jerusalem for an interrogation session. Israeli forces detained a Hamas official in the West Bank town of Al-Bireh on Sunday, according to local residents. Israeli soldiers raided and searched the house of Jamal al-Taweel in Umm al-Sharayit neighborhood before taking him into custody, the residents said. The Israeli army has yet to confirm the arrest. Al-Taweel was elected as a mayor of Al-Bireh in 2006. On an almost daily basis, Israeli forces carry out night-time raids in the occupied West Bank that allegedly target “wanted” Palestinians. Around 6,500 Palestinians are currently languishing in Israeli jails, according to a January report released by Palestinian prisoner rights groups.